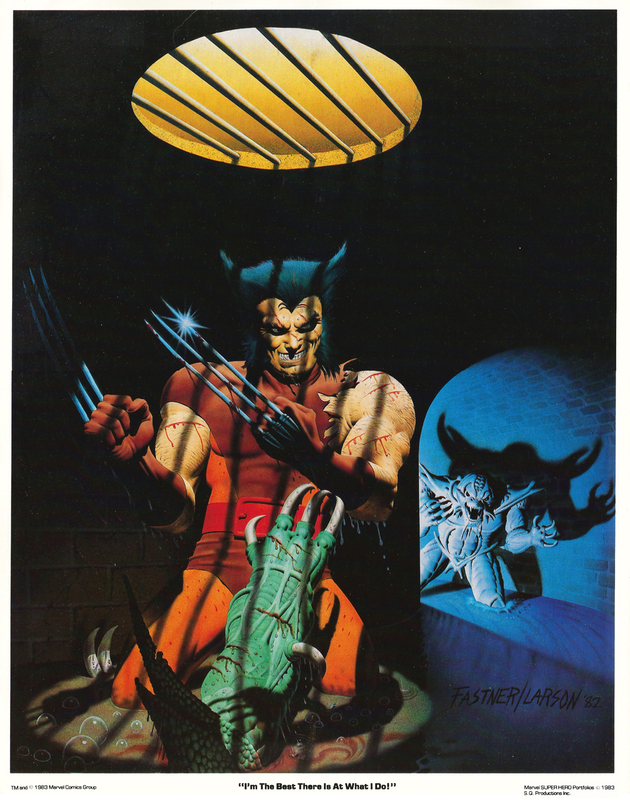 The Uncanny X-Men Portfolio, Set Two (1983) | 'TAIN'T THE MEAT… IT'S THE HUMANITY! 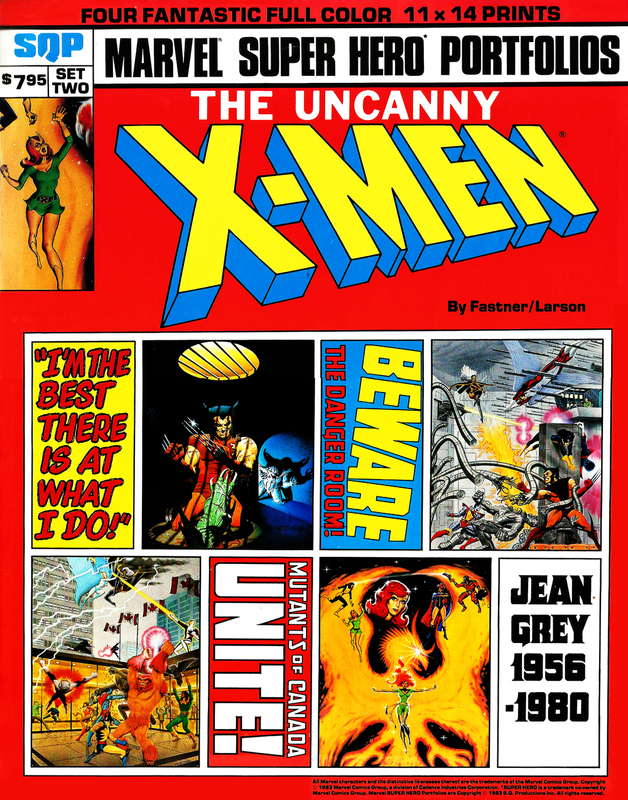 Published in 1983 The Uncanny X-Men Portfolio Set Two was the fourth, and last, full-colour Marvel Comics portfolio published by SQP. 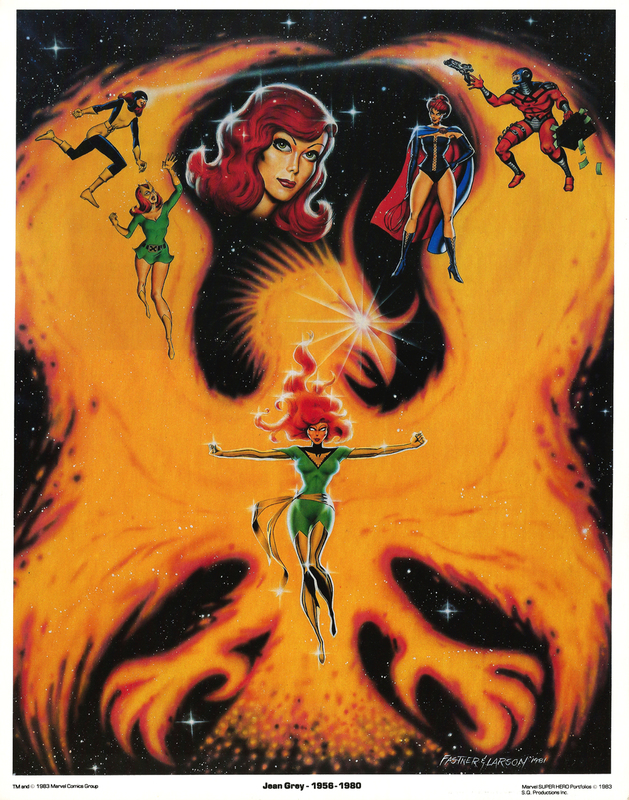 The set followed the same format as the three previous entries in the series – The Uncanny X-Men Portfolio Set One, The Incredible Hulk Portfolio Set One and The Amazing Spider-Man Portfolio Set One – four full-colour prints measuring 11 x 14 inches printed on thick white card stock, shipped with a cover sheet in a clear plastic sheath. This set originally sold for $7.95, a dollar more than the other sets. 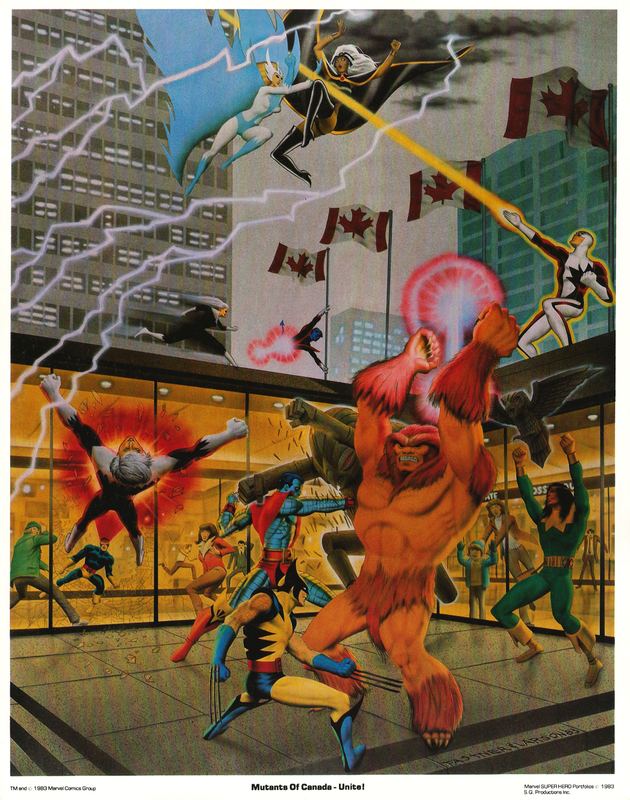 The four prints show painted scenes featuring Marvel’s popular X-Men superheroes: plate one, ‘I’m The Best There is at What I Do!’, depicts Wolverine fighting some subterranean lizard creatures; plate two, “Beware The Danger Room”, shows the team training; plate three, “Mutants of Canada – Unite!”, has the X-Men in combat with Alpha Flight and plate four, ‘Jean Grey – 1956-1980’, is a collage tribute to the recently deceased Marvel Girl/Phoenix. The four plates were painted by art partners Steve Fastner and Rich Larson who were responsible for the other three collections. Sadly this set is by far the weakest of the quartet and has a whiff of teenage art student homework about it. Although the Wolverine plate has some impact the other three are pretty weak, lacking any real focus or sense of action or drama. Compare the Danger Room print from this collection with the first plate (“Beware My Children – The Sentinels”) from Set One to see what I mean. 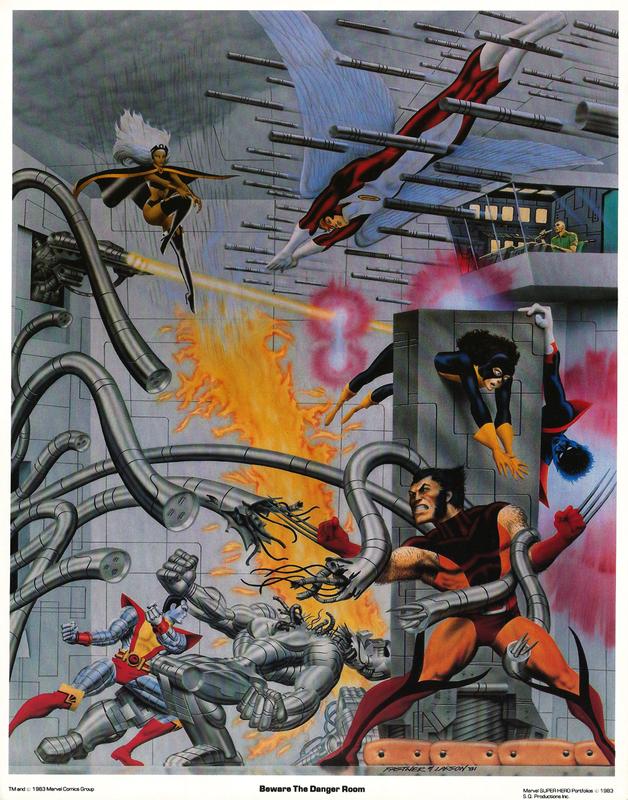 Although Fastner and Larson would go on to paint other portfolios for SQP (who seem to have had the portfolio market sown up in the 1980s) this was the last they did for the publisher featuring Marvel characters. SQP published two more portfolios featuring scenes from Marvel’s Team-Up series, which featured black and white artwork from numerous comic book artists, and I’ve looked at those here. Copies of The Uncanny X-Men Portfolio Set Two can still be found on ebay, but with prices ranging anywhere from $/£25 to $/£100+ it isn’t cheap. I’m not convinced the quality of the artwork deserves such a steep price and anyone looking to own these vintage portfolios would do better to track down the other three sets in the collection.